This past week I had the privilege of attending my first ASTD (American Society for Training & Development) conference in Washington D.C. It was fantastic connecting with colleagues, partners and clients in our nation’s capital, as well as getting a chance to learn more about current trends and developments within the industry. One of the biggest announcements to come out of the conference, however, was not a new product or service. Instead, the big news came from the organization itself. I was pleasantly surprised when I arrived at the convention center early Wednesday morning to discover the facility had been completely reworked over night. Brand new colors and signage trumpeted ASTD’s rebranding as “ATD”—the Association for Talent Development. As a marketer, I’m always fascinated by rebrandings. Obviously companies and organizations shift and mature over time, requiring a “face-lift” in order to reflect the changes. Some rebrandings result in increased awarness, like Old Spice’s clever series of commericals, while others create a bitter backlash, such as Tropicana in 2009. The key to a successful rebranding is not only a logo makeover, but an overhaul of the mission, vision and messaging of the organization. 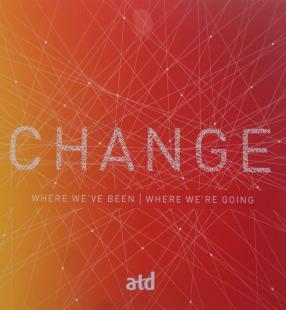 ATD clearly put a great deal of thought into the organization’s rebranding, as well as how to communicate the change to its members. In addition to the signage change on the last day of the conference, ATD President Tony Bingham made a special announcement the night before, explaining the reasons for the shift and what members could expect. The key message of the rebranding is the work of ATD members encompasses more than training alone. Globalization and technology have fundamentally changed the profession from simply training to helping employees achieve their potential. The removal of both “American” and “Training” from the organization’s name recognizes the slow shift that has been occurring in the industry for years. As an elearning company, we’ve seen increased interest in training from global companies and overseas businesses, proving human capital development is no longer only an American priority. The change to “Association” from “American” not only acknowledges the growing international audience, but also encourages collaboration by eliminating the focus on a specific region. The word “training” has also changed, and ATD’s move to “talent” is significant. I’ve written about this shift happening in individual businesses, such as NBC Universal Learning & Development’s rebranding as “Talent Lab.” More and more companies are moving away from compliance-based training in favor of ongoing development programs, expanding the role of the learning manager far beyond the traditional definition of training. The focus on the word “talent” also shows the importance of the individual employee in the learning process, and the influence individuals have on their own development. ATD is planning to incorporate changes gradually over the coming year, and will have co-branded material (ASTD/ATD) for the next few months. New communities of practice and content will follow later in the year, with the new CTDO magazine being launched in early 2015. For a detailed list of session recaps and the conference backchannel, check out David Kelly’s recap post.